San Francisco’s history offers lessons for the future. 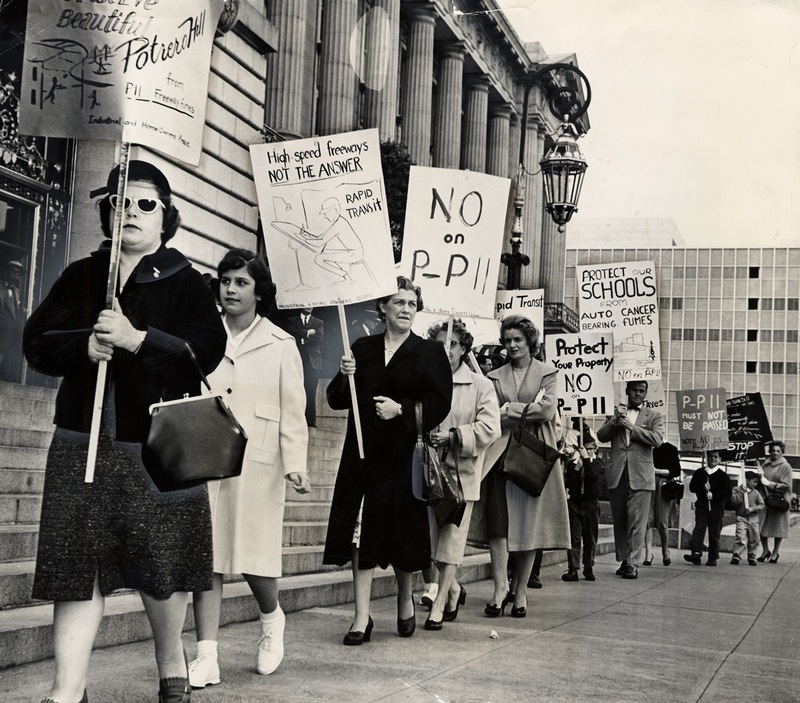 San Franciscans have a useful history of resisting grand development plans, whether they were driven by market forces, corporate developers, or the social engineering visions of politicians and city planners. As attention sharpens on the dire social consequences of the latest tech boom, memories of past battles bolster new activists in their efforts to stand up to the most recent waves of evictions, gentrification, and ill-conceived development plans that are presented as crucial and even inevitable for a modern city. Read one way, this short history demonstrates the relentless power of money in defining who is a San Franciscan and who can stay and who must go. But read another way, this history shows that there is historic precedent for optimism that the worst consequences of today’s creative destruction of the city can be averted if we know and use our history. The Freeway Revolt: In the middle of the twentieth century, at the height of a global era of brutalist modernization, San Franciscans stopped massive elevated cement highways from being built through the Mission, the Haight, North Beach, the Sunset, the Richmond, and wrapping around the entire northern waterfront of the city. In 1956, the California Department of Highways announced plans for freeways crisscrossing the city. Dozens of community groups emerged to combat the plans and over 70,000 residents signed petitions opposing the plans. By 1959, many specific routes had been cancelled by the city’s Board of Supervisors, a process culminating in votes in 1964 and 1965 defeating a proposed Panhandle/Golden Gate Park freeway and a Golden Gateway freeway. Through the Freeway Revolt, San Franciscans stunned the rest of California and the nation by refusing to accept federal and state plans to build freeways around and through San Francisco, and showed the power of activist residents to shape a city. Picketers protesting against the Southern Freeway marching at City Hall. Courtesy of San Francisco History Center, San Francisco Public Library. Fontana Towers: When twenty-six-story towers were proposed for the northern end of Polk Street and Van Ness Avenue in 1962, Russian Hill residents hired the then-liberal Republican attorney Caspar Weinberger to fight the project. Though they lost that battle and the Fontana Towers stand today, Weinberger developed an argument on behalf of a public right to access and view the bay, which ultimately won the day. The city eventually passed height-limitation regulations that prevented any more tall buildings from being built along the waterfront. The work of the Russian Hill residents and Weinberger echoes into the twenty-first century in the form of a ballot measure in November 2013 that defeated developers’ plans to build a 136-foot-tall multimillion dollar condominium project at 8 Washington Street, just south and west of the iconic Ferry Building. Another local ballot proposition this June seeks to preserve height restrictions on waterfront projects unless specifically overturned by San Francisco voters. 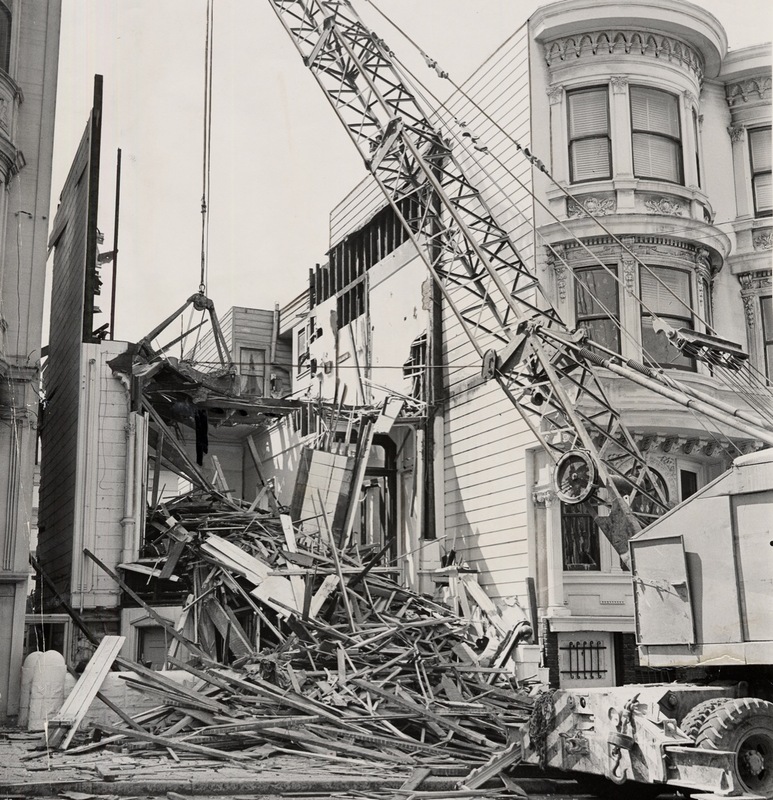 This photograph ran in the San Francisco Examiner with the caption “A huge crane smashes into kindling wood one of the blighted dwellings in the 1300 block of Ellis St. as the city steps up its war against slums in the Western Addition.” Courtesy of San Francisco History Center, San Francisco Public Library. The Redevelopment Agency’s “Slum Clearance” Programs: Throughout the 1960s, activist coalitions placed themselves literally and ideologically in the paths of the San Francisco Redevelopment Agency’s bulldozers and aggressive “slum clearance” programs. In the late 1950s, the agency began targeting the heart of Italian North Beach’s economic life: the Produce Market that once sat just north and east of downtown. By the mid-1960s, the Produce Market had been relocated south, and the former blocks of warehouses and food distribution facilities were replaced by freeway ramps and high-rise offices and apartments. Next, the Redevelopment Agency chose a corridor of dilapidated and overcrowded housing along Geary Street that ran through Japantown, adjacent to the large African American community in the Fillmore. Under the directorship of M. Justin Herman—San Francisco’s version of Robert Moses—dozens of blocks of Victorians were bulldozed, Geary was widened into a surface expressway, and a new Japantown was erected, with investments from Japan. When the Redevelopment Agency turned south of the new Geary Boulevard, the Western Addition Community Organization—and later the Western Addition Project Area Committee—put up fierce opposition to Herman’s plans, including the first lawsuits to mandate replacement housing. Although most of the black Fillmore was leveled, local black churches, the International Longshore and Warehouse Union, and other organizations financed rebuilding of cooperative housing blocks. MCOR Coalition: In 1966, a diverse coalition of white conservative homeowners, Catholic and Presbyterian-based social service organizations, Latino political groups and union locals, and radical left members of the Progressive Labor Party and Mission Tenants Union established the Mission Council on Redevelopment (MCOR).¹ MCOR demanded veto power over any Redevelopment Agency-led efforts in the Mission, and although Mayor John F. Shelley would not agree to their demand, the city’s Board of Supervisors acceded to the united neighborhood opposition and squashed urban renewal plans for the Mission. MCOR then disbanded, having fulfilled its central purpose. 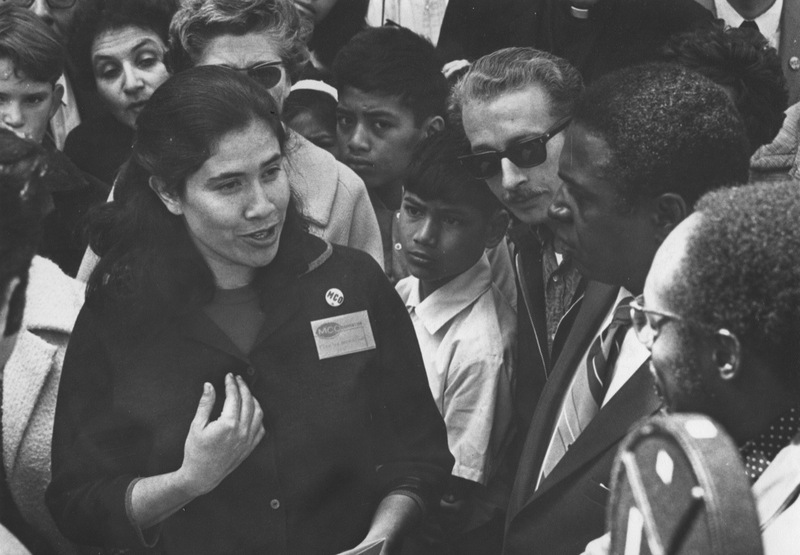 Flor de Maria Crane, MCO member, speaking to San Francisco Supervisor Terry Francois in 1969. Photography by Spence Limbocker, courtesy of Accion Latina Archive, El Tecolote Photograph Collection. MCO Continues the Work: A year and a half after MCOR disbanded, dozens of organizations and thousands of members formed the Mission Coalition Organization (MCO). They carried on campaigns to protect tenants from landlords, to gain employment for neighborhood youth, and to develop a range of social services for the Mission. MCO negotiated successfully with Mayor Joe Alioto to gain control over Model Cities Corporation money from the federal government. Over time, responsibility for managing those funds eventually shaped the organization in a more bureaucratic and less activist direction. One of its lasting legacies was the establishment of the Mission Housing Development Corporation, an agency that pioneered nonprofit housing development concurrent with similar efforts by the Tenants and Owners Development Corporation. Even after its dissolution, MCO left a legacy of dignity and self-respect that is hard to measure, plainly visible among the dozens of social service agencies in the neighborhood and the resilient self-confidence of the Latino community. 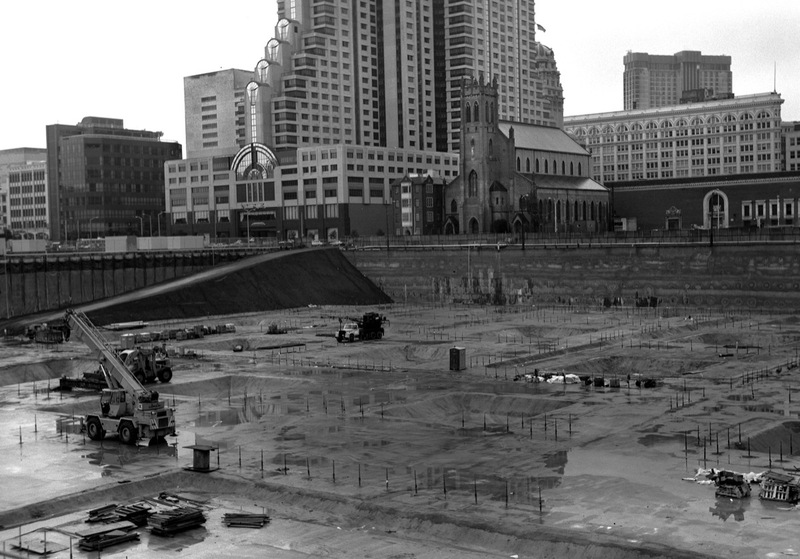 Construction site of the Yerba Buena Center and convention hall, Marriott Hotel in background, South of Market district. Courtesy of Dave Glass. TOOR’s Fight to Save SRO Hotels: In 1969, retired longshoremen and seafarers organized residents to form Tenants and Owners Opposed to Redevelopment to fight the Redevelopment Agency’s plans to clear the area south of Market on Third and Fourth Streets from Mission to Harrison, the city’s so-called “skid row.” The Agency sought to replace the largely single-room occupancy hotels that filled the area with a new stadium, convention center, and a cluster of high-rises. The retired longshoremen and seafarers—many with communist and left-wing roots in the 1930s in San Francisco—knew how to organize. Their lawsuits successfully guaranteed one-for-one replacement of housing units lost to redevelopment, and housing for displaced residents. Negotiations ensued, and by the mid-1970s, clearance of the area had been accomplished, but in exchange, hundreds of senior housing units were built, followed by museums, cultural centers, an ice rink, a children’s activity center, a Martin Luther King, Jr. memorial, and a two-acre public park. The convention center was forced to go underground, and no stadium was built in the area. The first buildings in the area were Woolf House I and II, and the Mendelson House, all subsidized senior housing, named after George Woolf and Peter Mendelson, two of the most stalwart activists who had opposed the Redevelopment Agency. 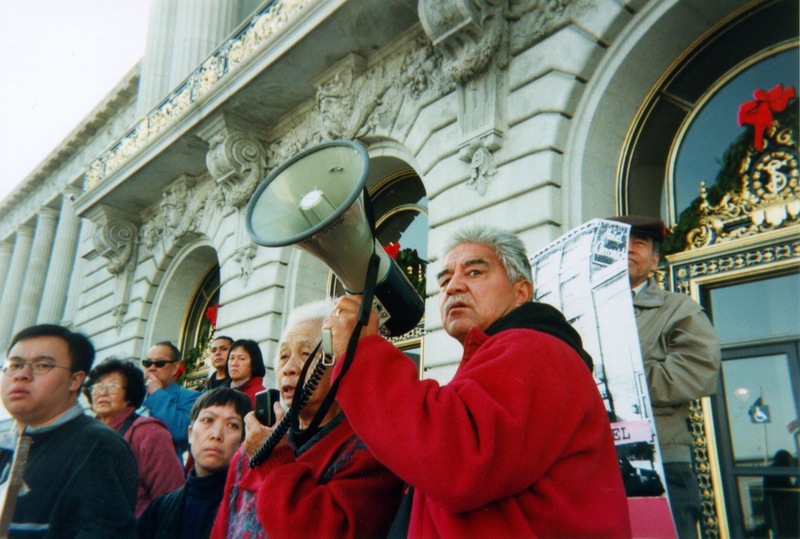 Longtime anti-eviction activist William Sorro protesting on the steps of San Francisco City Hall. Courtesy of Chris Carlsson. The International Hotel: Late 1960s and early 1970s battles surrounding the International Hotel, or I-Hotel, symbolized for many an epic struggle between long-time residents of immigrant backgrounds and the forces of capital and modernization. The small brick residential hotel had been home to Filipino migrant laborers for decades and was the last remnant of what once had been a ten-block long “Manilatown” along Kearny Street. Some of the elderly men living in the I-Hotel had called it home since the 1920s. Sitting at the north end of Kearny Street, the hotel was squarely in the path of the expanding Financial District at a time when the zone just east of Chinatown was being eyed by major investors. Hundreds of young activists flocked to the cause when residents of the I-Hotel received eviction notices in 1968 from Democratic Party financier and major San Francisco real estate mogul Walter Shorenstein (president of the Milton Meyer Company, which had purchased the property with plans to build a parking garage). 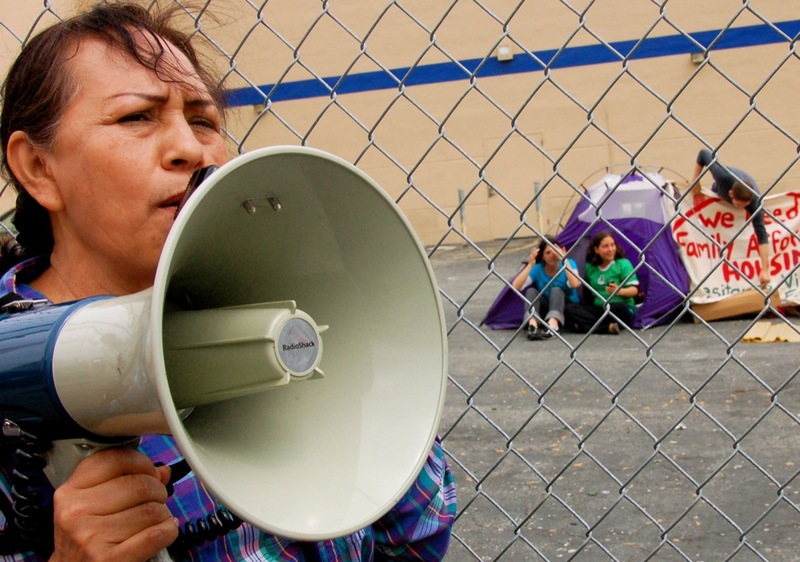 Demonstrations, lawsuits, and ongoing public campaigning held off the eviction for years. A negotiated truce with Shorenstein was abandoned the day after a mysterious fire killed three tenants and gutted the third floor, but the movement kept the eviction at bay. By 1974, a Thai businessman using his Four Seas Investment Corporation bought the building and the eviction was again put in motion. Demonstrations, appeals, and preparations to resist the eviction enjoyed widespread support from many different activists and communities, including Mayor George Moscone in 1976 and Sheriff Richard Hongisto (who went so far as to spend five days in county jail for contempt of court for his refusal to evict the tenants). But on 4 August 1977, the eviction was carried out in the predawn hours by hundreds of policemen and sheriffs climbing fire department ladders while police on horseback attacked thousands of protesters ringing the building’s sidewalks. The I-Hotel was a bitter loss for the many activists who dedicated so many years to its defense. Affordable housing advocates protest planned luxury condos in the Mission in 2007. Photograph by Brooke Anderson. Community Housing Movement and Rent Control: During the 1970s battles against the Redevelopment Agency and to save the I-Hotel, housing and community development corporations were launched in the Mission and South of Market. These corporations were dedicated to building affordable housing on a nonprofit model. Meanwhile, others organized for tenants’ rights and rent control measures. Calvin Welch has argued that “the existence of the community housing movement by 1977 would so influence the district-elected Board of Supervisors that in 1979 they passed San Francisco’s Rent Stabilization and Arbitration ordinance, which by 2008 covered some 170,000 rental units.”² Key to the success of San Francisco’s rent control since the first incarnation was passed in 1979 by legislative vote was the repeated popular initiatives passed to bolster it and strengthen its financial controls. Joined in the following years by community housing development efforts in the Haight-Ashbury, Chinatown, the Tenderloin, Bernal Heights, Bayview-Hunter’s Point, and the Western Addition, by 2008 these nonprofit agencies had developed nearly 26,000 permanently affordable housing units, mainly for families and seniors earning less than 50 percent of the median income in the city. Tenderloin Fights Against Tourist Hotels: In the late 1970s and through the 1980s, activists sponsored by Quakers, Franciscans, Methodists, along with a newly formed North of Market Planning Coalition and others organized a neighborhood campaign to save affordable housing in the residential hotels of the Tenderloin. The forty-block area covers the lower slopes south of Nob Hill to Market Street, between the shopping district around Union Square on its east and the Civic Center on its west. Since the early twentieth century, the Tenderloin has been a haven for outcasts, seniors, the poor, and people in trouble who mostly live in single-room occupancy residential hotels. In the late 1970s, a shift in San Francisco’s economy from manufacturing and global trade to tourism led many hotel owners to move long-term tenants out in favor of the much more lucrative tourist trade. When major hotel chains announced plans for massive hotels at the eastern edge of the neighborhood in 1980, a successful grassroots campaign gained major financial concessions from the big hotel companies and developed anti-gentrification zoning plans. Some of that money was channeled into nonprofit purchases of key properties throughout the neighborhood so that today, one-third of the housing in the Tenderloin is owned by nonprofit housing operations. Throughout the 1980s, the Tenderloin’s composition changed, with an influx of Southeast Asian refugees from Vietnam, Cambodia, and Laos, who joined efforts to halt plans to shift the neighborhood toward the expensive tourist trade and to gentrify its elegant early-twentieth-century apartment stock. 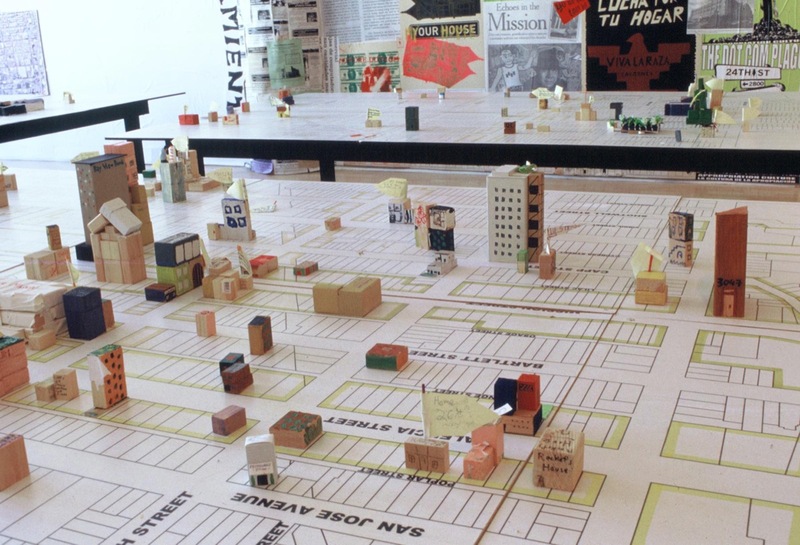 The People’s Plan, focused around a large three-dimensional map of the Mission and dozens of graphic posters, is a community-based planning process to envision and create a sustainable and healthy neighborhood. Courtesy of the San Francisco Print Collective. The High-Rise Revolt: A high-rise revolt that had begun in the 1970s culminated in the 1980s with the passage of Proposition M, a long-sought growth limitation ordinance. In 1970, the US Steel Corporation, then the largest single corporation in the world, proposed to build a 550-foot high-rise on the waterfront a short distance north of the Bay Bridge. This set off a storm of protest that led to what came to be called the “High-Rise Revolt.” Although in November 1971, voters defeated a measure to limit heights on buildings, subsequent efforts of activist Alvin Duskin, San Francisco Bay Guardian publisher Bruce Brugmann, and others seeking to limit development (or as some put it, to “stop Manhattanization”) led to a series of elections that culminated in 1986 with the passage of Proposition M. Touted widely as a growth-control initiative, the terms of Prop M were more nuanced. The measure halted unregulated downtown growth, except across Market Street to the south. It established an annual limit on the square footage of office space that could be built each year, along with a “beauty contest” for proposed new buildings. Prop M also provided for neighborhood zoning to limit commercial developments through a local planning process. An unintended outcome of the High-Rise Revolt is the edge-to-edge suburban office park architecture of Mission Bay. San Francisco’s latest “city within the city” neighborhood, Mission Bay has been built over former railyards and warehouses that in turn were built on long-ago filled-in bay lands. Mission Bay master plans called for achieving maximum floor space while maintaining relatively restrictive height limitations. MAC activists were pulled into a years-long process of planning the rezoning of the city’s eastern neighborhoods. Repeatedly frustrated by the ad hoc nature of contesting one proposal after another, activists engaged in a long-term effort to reorganize land-use priorities as reflected in basic zoning documents. By the time they completed the new planning documents, the grassroots energy that had buoyed the Mission Anti-Displacement Coalition had dissipated. Similarly, activists in other neighborhoods were drawn into a more bureaucratic relationship with city agencies, planners, and politicians, and the grassroots independence that had fueled electoral and social revolts passed. 1 “‘All Those Who Care About The Mission, Stand Up With Me!’: Latino Community Formation and the MCO,” Ten Years That Shook the City: San Francisco 1968-78, Chris Carlsson, ed. (City Lights Foundation: 2011). 2 “The Fight to Stay: The Creation of the Community Housing Movement in San Francisco, 1968-78,” Ten Years That Shook the City: San Francisco 1968-78, Chris Carlsson, ed. (City Lights Foundation: 2011). 3 “Tenant Power in San Francisco,” Reclaiming San Francisco: History Politics Culture, James Brook, Chris Carlsson, Nancy J. Peters, eds. (City Lights Books: 1998). 4 This story deserves much more explanation than can be provided here. Good sources are two articles in The Political Edge, Chris Carlsson, ed. (City Lights Foundation: 2004), “A Decade of Displacement: San Francisco’s Hidden Housing History” by James Tracy, and “McFrisco” by Quintin Mecke. A longer treatment can be found in Karl Beitel’s Local Protest, Global Movements: Capital, Community, and State in San Francisco (Philadephia, Temple University Press: 2013).